I'm looking for photos of aposematism and mimicry for a talk. 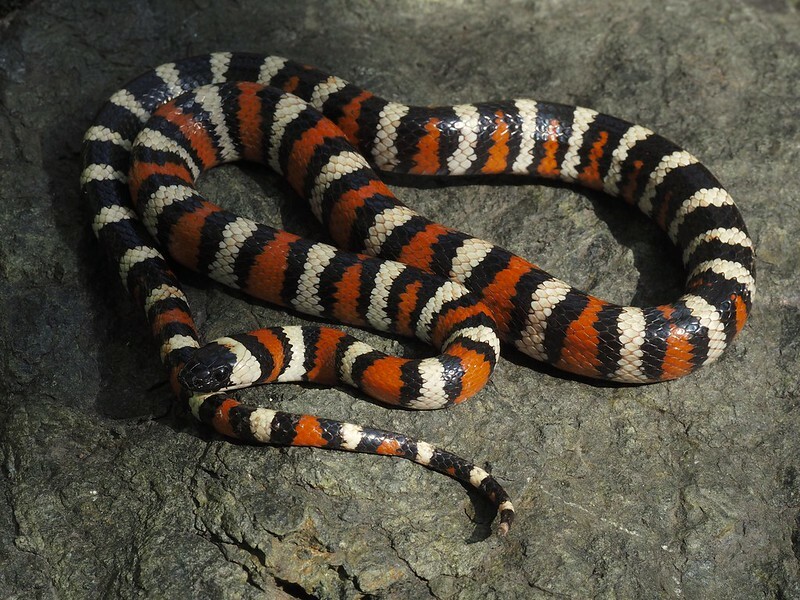 Proper brightly obvious and tricolor-ones, but mostly interestested in species that have a dorsal pattern that can be perceived as zigzag-pattern as in European vipers. Thinking Sistrurus and Ophryacus s.l. Tons of them in Africa. teach me. Credit given, not paying as I won't be paid for the talk. Full credit given to the photographer, of course. edit: By "teach me" I didn't mean I needed help on the subject. Just the photos. Marti, Here's a Natrix maura ("Viper d'eau") from the south of Provence, France. PM me if you need some more specific info. edit: the first photo is a do-touch/don't touch. Great zigzag. Pm sent. Here are a couple tricolors if that helps. If you like them let me know and I can send them to you to download. Motion Dazzle Camouflage i think is mistaken for mimicry, especially when an unconscious anthropomorphism is applied in study even academia, as when a subject is pondered in formalin, or in textbook illustration or in captivity. Instead of framed in the moving dynamics of fleeing a predator. The diversity of non human visual perception i also think is bipassed by our own projected visual perspective. I thought this looking at types of contrast markings that are seen repeated through different genera and unrelated animal families and comparing them to warning iconry and flash styles before i found out there was an actual theory. It's just snakes you want? 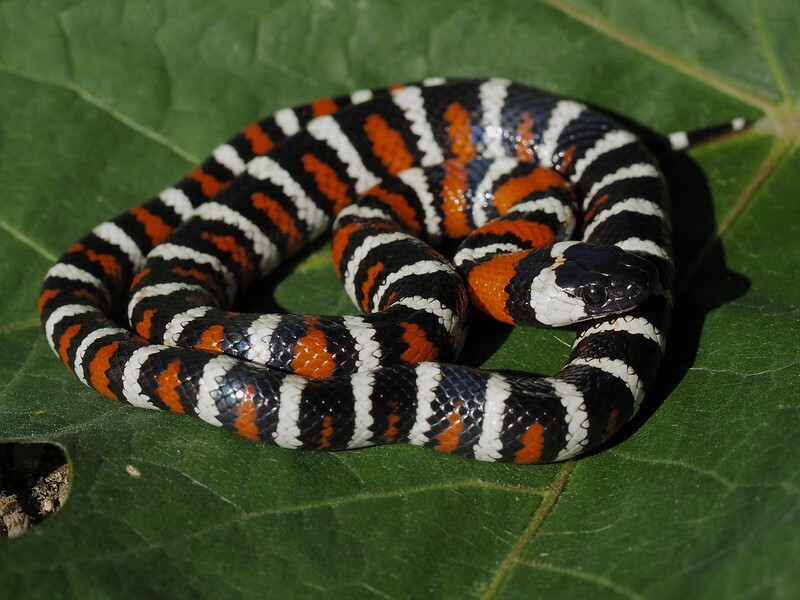 Some great examples of aposematism and mimicry in other herps as well. Nicholas wrote: Here are a couple tricolors if that helps. Please do, Nicholas. Thank you. Kelly: I've got opinions on mimicry and flicker-fusion, but very busy atm, so will have to get into it another time. Antonsrkn: Just looking for snakes this time, thanks. Tangential to your main topic, is defensive strategy combined with similar pattern and even behavior combined with noise. In the North American southwest, any field herper knows that two commonly encountered species are rattlesnakes (Crotalus) and gopher/bull snakes (Pituophis). It is my understanding that the popular thought is that rattlesnakes’ evolutionary adaptation, the rattle, was an primarily an advantage to reduce the incidence of being trampled by large grazing mammals, and maybe secondarily to impress mammal predators. (One can imagine a Bison that has been tagged even once, not wanting to step near a rattlesnake again. Over time, you could understand this even could become a “genetic memory” in the grazers and predators alike. The “pits”, of course, hiss loudly, vibrate their tails, and assume defensive positions that may have evolved sequentially or in parallel with rattlesnakes (I’ll leave that discussion to researchers), but when you see them react to a predator, and see the predator’s reaction to the behavior, it’s hard not to believe that the predator is staying cautious and “pit” may be staying safer because of its similarity to its venomous brethren. Of course, one may ask, where does a wolf decendent that has been strongly shaped by "human selection" innately have such caution to the pit's behavior? In the Americas, I'd find it very hard to believe that noise, when used, wouldn't be a part of it like in your example. Echis and Dasypeltis is another example that comes to mind. Aposematism and mimicry get some herpers/herpetologists all worked up, so won't get into it right now. Just a quick comment on previous post; for example a banded pattern can represent both mimicry and clicker-fusion and they don't have to be mutually exclusive. Mimicry also doesn't have to be perfect. Oh, and as and as addition my earlier post, tricolor photos are very welcome. Classic examples after all. Ive seen the same innate caution in many dogs, towards dust busters and confounding mechanical toys. I do not think that the Pom isnt aware that its an animal, or even a snake, it probably is, but snakes of all species vibrate their tails, flatten their heads, gape, and make the most of what defensive capacities they have and all must project themselves forward to achieve an effective impact of contact. They all share the same native repertoire available to a linear, limbless form, of fairly good to very good musculature. This would include boas and pythons, most memorably Rocks that readily emptied fluids and urates and musk glands like other snakes, with a vigorous caudal undulation that was even more distinctive and stereotypical in action than many of those. Pease dont think I want to debate I am open to the culture-finesse of behaviors MonarchzMan described in brief - my difficult to explain quandary is in a view that carnivorous predators assess snakes as food very often first, and we generally do not, perhaps we did at one time but that has been replaced by other impulses, in many people/s. I just think we are more species-specific oriented than other animals, that respond to action, sound, visual schematics and whatever version of risk/pain/potential cognitive they possess. These are just my thoughts, I havent delved too deeply in studies about it but I am willing to learn. Ive seen the same innate caution in many dogs, towards dust busters and confounding mechanical toys. Kelly, of course, anyone who has had a dog or a cat has seen similar behavior to dust busters et al, but ask yourself, where did that innate behavior come from? You see it in a puppy’s or kitten’s play and that very animal could well have been taken from its mother and raised by humans. These innate behaviors come from a genetic memory, honed through many years of survival strategies. For background, this particular Pom had never showed any interest in eating a snake but most certainly reacted to a possible a threat to his pack because of this gopher’s behavior (and possibly smell even enters into it???). This same dog regularly met calm Black Ratsnakes here in the east paid little attention. This same dog charged in without hesitation and attacked multiple large rats in a barn, closed in, and dispatched them quickly, but would not do so to a snake that was rattling its tail, hissing loudly, maintaining a defensive coil, and striking out. No one taught this dog to use different behaviors. They don’t happen in a vacuum or through spontaneous generation. Dogs’ heritage was first shaped by several millennia of wild living as wolves, then having been humanly engineered (and not necessarily humanely engineered) in just the past hundreds of years to promote various colors, shapes, sizes, and, yes, behaviors. but snakes of all species vibrate their tails, flatten their heads, gape, and make the most of what defensive capacities they have and all must project themselves forward to achieve an effective impact of contact. Not necessarily true, but that aside, again, how did they come to develop these strategies? I didnt proof read my post for species-specific (*) loopholes, but yeah, those defensive postures and kinetics are available to all typically organized snake physicalities, sometimes augumented and other times not as frequently seen. I thought I kind of touched on that with the python smearing. When you think of smearing probably 90% of people think of Thamnophis. Not a rock python doing it with such pizzazz. There is a link around here of a PDF on defensive and threat display convergence shared not only throughout snake taxa but limbless, elongated animals that arent even vertebrates. I could try to find it, but something that is never aknowledged in these discussions is how human imagery and a comparative mental set is very difficult for people to shed. Edit to add, in Rattlesnake Avoidance Training, I am wondering how it ties in. I dont know much about it, read some critical review of method. A post here also shows feral cats in a casual curiousity milling around cobras. None of which proves anything but I still lean toward the kinetics expressed and perception grid of the predator respondent, not a particular species existing that shape their reactions. There are few singularly functional absolutes in animal behavior. I didnt mean to sound dismissive with my Pom observation. I get a little aspergian to material and off social cue; to me watching, it was the content of the display that included effective elements of alarm and achieved protection. Im not totally convinced it was innate fear of rattlesnakes in the example provided. I think this is one of those things that is impossible to prove in the example given, but it was extremely cool video, and if i am mistaken about a venomous precautionary mechanism in mammals I hope I am able to receive correction, but I still think it would be just as important for people to examine the human focus aspect I mentioned. I think it has merit in many contexts and that its worth exploring. We should return to the OPs important request of photos. I am curious about pattern visual mimics and am only significantly familiar with American examples, I wonder if the biodiversity of tropical Asia and Africa have a different disparity, and if temperate localities less opulent biodiversity makes it more successful? Big Eye marking mimics would be cool to see. 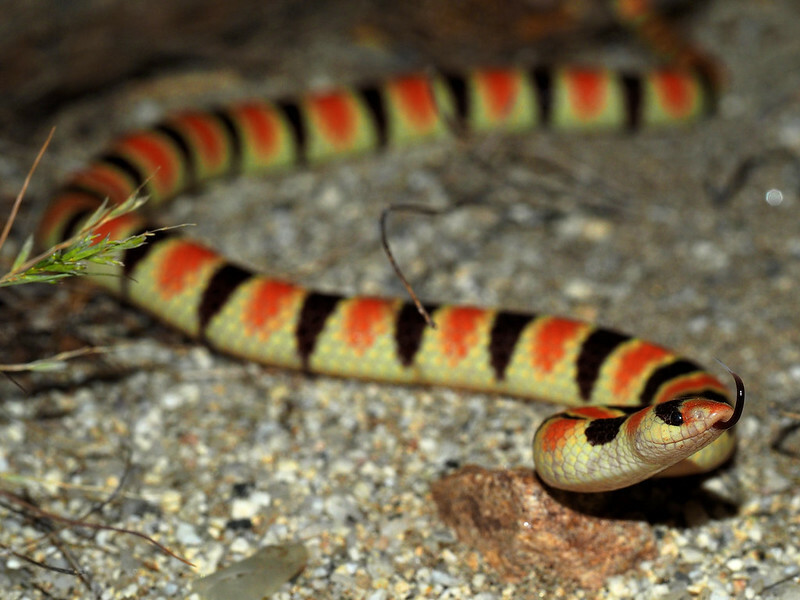 Last night I dreamed of a frilled snake discovered by somebody here and they posted pics. Its unfortunate it was only a dream because that would be awesome. Is the comment that I am way off, supposed to shut me up or something? Im asking that with a well meaning spirit, because I asked for more information and I was interested, and see with the butterfly study how the mitigating of conspicuous colors to refine the question of whether it is mimicry or sensory overload, ie; startle response proved out that mimicry of the eyespots proved more effective in the butterflies. Moving along, as you say, neophobic response that can delay reaction time and an initial or learned reaction were described as known anti predator stimuli. I had mentioned that in the active, sound accompanied display of the gopher snake display, with kinetics and sound being the aversive, as example of diverse anti predator signals animals employ, which I wasnt the one to bring up as a somewhat unrelated tangent. So in the interest of specificity it would be helpful if you pointed out what is it you liked in the content of what i wrote, and what is it that was way off, because it looks that I described the dynamics of what is called neophobic response fairly aptly - and you still havent answered any of my snake/predator questions. If I put too much emphasis on anthropocentric projection, and iconic species pre occupation mentally pruning away or unaware other clades equally or maybe even more influential - I understand now that it is not an operative in academia as I had assumed. Anthropocentric projection is bane to me I notice rampant in informal discussion and I am correcting that view in terms of Science and studies. I want to learn its a privilege to me. I did not have the opportunity to attend University so my awareness of academic reductive stricture in opinion is flawed and incomplete. I am very interested in animal behavior and perception. Too interested to be married to assumptions of any kind. Sorry for snapping, Kelly. Never any intention of shutting anyone up. Got a bit annoyed as the thread was originally one about photo requests. I offered you a reference from where you can start reading about eyesports and warning coloratons. Read the paper and the references within, no easy way around it. SciHub is your friend. If you want answers, please ask specific questions. Aposematism/mimicry is a bit of a minefield, so you need to read into it to figure it out. I’m into it for more than a decade-and-a-half and find many aspects difficult and confusing. I’ll gladly get into aposematism and mimicry and will answer questions, but simply haven’t got the time right now. No malice at all. Questioning and asking questions is a good thing. You were fine, I should have been more respectful of your time and I apologize - thank you, you are gracious and I understand. Thank you for your directives I will do it. Cheers, Kelly. Not the slightest of problems. Haven't been here since your above post. Keep your good thing going. No apols, but mutual respect. Again; there's no easy way to get into apo-mimicry. Pm me and I'll help you out when I've got time. Cheers, Kelly. Not the slightest of problems. Haven't been here since your above post. Keep your good thing going. No apols, but mutual respect. Again: there's no easy way to get into apo-mimicry. Pm me and I'll help you out when I've got time. ... Bill, just watched that horrific video of the mutant canid w/ the pit. not what i have seen w/ coyote & pituophis ... perhaps the limits of sample size ... perhaps the artifact created by pups & an empty belly .. but i am very inclined to go w/ the natural rather than the mutant ... my conclusion ( again limited ) is a hungry canid nor hawk, is not disuaded by an elaborate defense routine of the prey. I do appreciate you posting the video tho, & it does fuel the discussion.